In theory we have had internet while cruising through some of the poorer parts of Indonesia. In reality, we could often connect but could not even open Hotmail the connection was so slow. This country has followed the route of many developing countries and just skipped the entire idea of wired telephones. Instead, everyone (except us) has a cell phone. It is quite bizarre to see someone in a dugout canoe with a cell phone – says something about convergence of cultures and technologies, but too complicated for me to figure out. Anyway, as you cruise along the coast you will see red and white painted radio towers that combine both microwave transmissions and cell antennas. One tower means quite a small village and four or more, quite a sizeable town. The only problem is that the signals are better-suited for phones than data. There is an additional problem in that you buy time but have to register it using a series of SMS messages – all in Indonesian. Now we are in Bali and the cell signal is very strong. 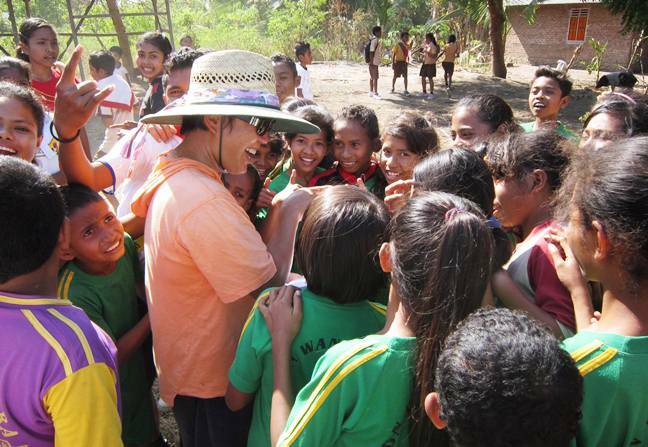 We have now gotten well ahead of the Sail Indonesia schedule since we need to leave for South Africa soon. It appears we have not missed much. 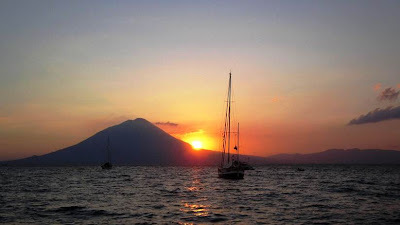 We went to the first three Sail Indonesia stops and quite enjoyed the festivities. We now have been to five events that featured traditional dancing which sounds like it should be boring and repetitive but nothing could be further from the truth. The range of dances has been incredible and there is always something different to see. Turns out that at the next two stops in the route the planned activities did not happen since the local governments did not approve the needed budget. In a way this does not bother me since the money could be more usefully spent meeting the needs of the local people rather than those of rich boaters. The whole process is supposed to promoting tourism but I don’t see how this actually happens to any significant degree. 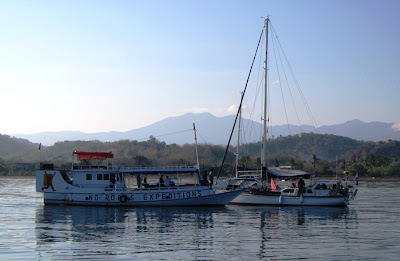 This is the anchorage in Lembata, Flores. There is never a shortage of wonderful scenery. 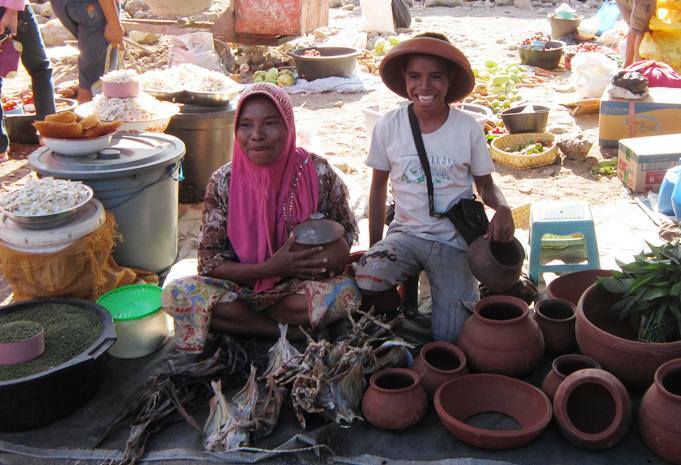 Sailing along the coast from Alor has both its pluses and its minuses. On the positive side of the ledger there is a great deal to see. All of the islands are quite mountainous (to more than 3000 m) and its not rare to see smoking volcanoes. The villages are interesting as are the local watercraft which range from very small dugouts to elaborate fishing vessels and tourist boats that look like the trading boats of a generation ago. The people are incredibly friendly, welcoming, and curious. On the way to the market in Lembata we were passed by several trucks and buses filled with kids in different uniforms. Later we passed a field where all these groups had congregated. We thought it might be a soccer tournament so went to look. Turns out it was an effort to pick up trash in the entire community so it would cleaner before for the National Day holiday that was coming. This was much needed as the country (and often the water) is pretty dirty. The ability to produce trash in a developing country seems to come long before the ability to deal with it. When we appeared we were swarmed by kids who wanted to know where we were from, etc. They all wanted shake hands and be in a picture with us. I got this picture when they these girls were too busy with June to notice that I was taking their picture.We also talked at some length with one of the teachers who was organizing the venture. June's Aussie straw hat was later lost at sea which was a bit of a tragedy. Shopping is great fun. 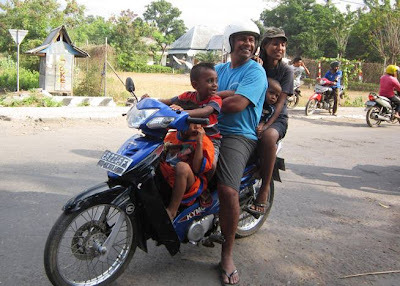 In Lombok we walked to quite a large market and returned home in a pony cart. There are dozens of these that play the role of taxis. June is remarkably adept at communicating with the merchants and managing to bargain for a decent price. You really need to do this otherwise you end up paying way more than market. For example, one of the pony cart drivers wanted 50,000 rupiah for the relatively short trip back to the boat. June asked a merchant who did speak good English how much it should be – 10,000 and this is what we paid. It was such fun that we added a 5,000 rupiah tip (about 60 cents). Told the driver it was for a treat for the little horse but we don’t think he understood. In the market. Many of the market areas have sun awnings but they are not tall enough for me to walk through without bending over. June does not have a problem though. June has learned enough Indonesian to do most bargaining, but shoppers who know English are very helpful and want to make sure that you are paying a fair price. Indonesia is a country of scooters and small motorcycles. This is the family car. On the negative side of the ledger … we have been motoring way too much here. The winds tend to be weak and not at all reliable. If you end up sailing more than motoring (or motor-sailing,) on a given day that is good, but not common. The exception to this is when you cross the straits that exist between islands. Here you often will have 25+ knots. Some of these straits are quite wide and it can take several hours to cross, during which you may have currents helping (or hurting) your progress. Also it is hard to keep the boat clean. Most people cook on open fires and there is a lot of soot in the air at times that ends up on the deck. Finally there are the prayer chants. Some are quite melodic, others just loud. But it would be nice if the first one was a little later than 4 am. When we visited large Islamic cities like Cairo and Amman there was one chant that came from high—quality PA systems. Here, each mosque does its own chant often all at the same time. Even smallish towns will have multiple mosques/chants. Our record was five going at one time. One of the neat things we got to do was see Komodo dragons. They are only found on four islands and most are on only two: Komodo and Rindja. These two islands are in the strait between Flores and Sembawa. We could have taken our boats to them, but the usual problems of currents and poor anchorages encouraged us to go on a local tour boat. We started with crews from four sailboats, but a half hour or so out there were large clouds of smoke coming out of the engine room of our boat (everyone had brought their life jackets with them since the local boats do not have such luxuries). After a few minutes another tour boat that was passing took us on board. One couple who are cruising with an 11 month old baby decided that they did not trust the local boats and asked to be taken back to their boat. This was perfectly understandable. We were picked up at our boats for the tour to Rindja. This is the tour boat that caught fire. the replacement one was not as large or fancy. The rest of us, along with three English tourists who were already on board, had a great day. We went to the national park on Rindja and saw a dozen or so dragons, and they are nasty looking beasts. The males can be 3.7 m long. There was a list of ‘incidents’ on a bulletin board in the park. Since 1987, 17 people have been bitten in the park and three have died. When you are in the park you are accompanied by a ranger with a long (2+ m) forked stick if one of the dragons should prove too aggressive. A real problem is that they are camouflaged very effectively and if their tongues are not flicking around, the only thing that is moving are their eyes. 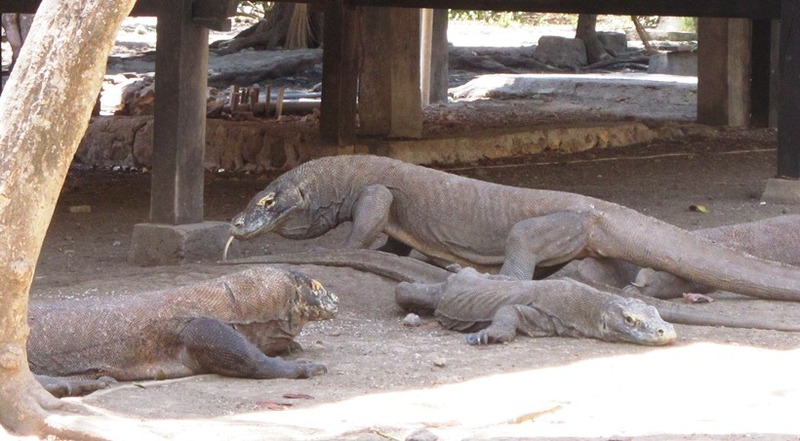 Komodo dragons on Rindja island. These ones are attracted to the smells at the kitchen in the national park. The park staff live there with their families in buildings on stilts but the dragons on occasion will go up stairs. The biggest one in this group was about 2.5 m long. Nasty looking beasts. We are now in Bali which has a small marina that is not particularly nice but the only option in the area. It is also quite expensive by regional standards – as is Bali in general. Getting to the marina was chaotic. The channel in is not all that wide and very shallow on either side and very busy. As we came in, there were ferry boats (mainly fast catamaran type), tugs, and many recreational boats coming and going. These include numerous jet skis, boats pulling tourists on floats, people fishing, and parasail boats. We passed one small boat with two guys fishing while wearing motorcycle helmets. Couldn’t quite figure that one out but it was a fitting commentary on the chaos. We originally planned to stay in Bali to Sept. 15th but it turns out there is a race coming from Australia and we have to leave on the 10th. Our Indian Ocean crew were able to change their schedule so we can leave then. This is actually a plus since it gives us more flexibility down the line. We have been very busy doing every kind of maintenance we can think of on the boat in preparation for the passage. We have also remade the boat as a cutter by setting up the inner stay and putting the sail on it. As well, we will have the storm trysail lying on deck on its track. Our route to Richards Bay, just east of Durban, South Africa will include stops at Christmas I, Cocos-Keeling I (these are both Aussie territory so we had to get new visas), Rodriquez I and Mauritius, then north around Madagascar and down to South Africa. It will be more than 5000 miles through some windy, rough ocean so we want everything working well. An addendum to this post. Did an inspection of the rig today and was most annoyed to find that one of the lower shrouds has a broken wire. This should not happen since the rigging was replaced only three years ago. There are no riggers in Indonesia and I checked with DHL who are the best couriers here and it would take a week for delivery and would cost almost $400. At this point I am considering hopping on a plane to Perth, Australia to get the needed wire and fittings. Darwin is much closer but at least three airlines fly to Perth so the fares are much cheaper. I should be able to do it for about the DHL cost. The joys of cruising in areas that are not the home to many sailboats. In answer to the questions posted in the comments to our last posting. The security situation in Indonesia is much improved. The problems used to be near Singapore and in northern Sumatra and there has been more policing. Apparently the great tsunami that ravaged Sumatra contributed to a major reduction in piracy since so many people were killed and so many boats destroyed. We have found Indonesia to be a very honest country with the exception of merchants who try to charge foreigners a ‘special’ price – which does not bother me at all. In one place I left my Crocs on the dock by accident when I was getting in the dinghy (they were very sandy). Next morning they were still there in spite of many people wandering by. We have a Northern Lights 5 kW generator and it seems to have worked very well for us overall. We had to have it rebuilt when we bought the boat because the previous owners had not used it enough. It had barely 300 hours in something like 12 years. Apparently the secret is to use a genset regularly and when you do, make sure there is a good load on it. The newer generators seem to have fancy, solid-state controls that monitor and report on everything and we have run into more than a couple of boats who have had problems with the control units. It may pay to keep things simple. Posted by Bruce at 7:35 p.m.
September 6, 2012 at 9:24 a.m.
September 7, 2012 at 9:27 p.m. It's John & Claire, from the boat that picked you up from your burning boat on the way to Rinca island! Great to meet you guys, we had a great day and you guys were an unexpected bonus. We are back in the UK and missing Indonesia already! Have a safe voyage onto SA. September 10, 2012 at 4:49 p.m.
October 13, 2012 at 10:56 p.m.
Long time no talk! We're in SA now and hopefully this blog will be up-to-date soon. Sail Indonesia rally was a great fun. Unfortunately we had to leave it earlier heading west. November 30, 2012 at 3:29 p.m.